Every afternoon on her way to work, Mystery rode her rusty, squeaking bicycle across the harbor town of Silence, past the convent school that she, like the children of most of the town’s more comfortable families, had attended as a girl. Although she had not excelled in school, she had loved exploring the convent grounds, hiding in bushes and closets, evading the stern glares and more concrete disciplines doled out by the Sisters of Perpetual Martyrdom, fascinated by the convent's detailed, often gruesome statuary. Eventually she had been expelled for her consistent disobedience, but each day she stopped her bicycle at the convent gates to peer between the wrought iron bars, squinting at the gory statues: Saint Sebastian, peppered with arrows, a holy pincushion drooling marble ichor from a hundred gashes; Saint Lucy, looking blindly to Heaven, stone hands raised above her head in supplication to the Blessed Mother, stone eyeballs rolling in the dust at her feet. Mystery had often wondered what forbidden sights Lucy had seen to merit such treatment. She recalled many such depictions, but these two, most vivid now in her memory, were the only sculptures visible from the gates. She brushed away a lock of gray hair, and squinted between the bars, noting the placement of Lucy’s eyes, the angle of her chin. As she had so often done before, she tilted her own head in imitation of the saint, imagining her own brown eyes in the dust, her long nose pointed improbably toward a cluster of berries in the convent shrubbery. After a moment, she tucked her navy blue skirt between muscular legs and resumed riding her bicycle. If she did not arrive at the Eye of the Storm tavern an hour before its patrons, the soup would be thin and watery, and the Hag would take their complaints out of Mystery’s wages. The basket mounted above her rear tire that day contained several carrots, potatoes, and onions – nothing particularly interesting or unusual for the time of year – but it also contained a newspaper-wrapped parcel of meat, cut into cubes. This evening the soup would be rich, and the fishermen would eat well. When she arrived, Mystery nodded with satisfaction around the tavern: The new girl who had taken over the night before was fastidious: the floor was well swept, the firepit in the center of the large main room contained sufficient smouldering coals to keep the soup cauldron simmering slowly. Mystery added water and dropped in her vegetables and the cubes of meat. She added a log to the fire and began the business of preparing to open the Eye of the Storm. She took the stools from atop the tables and placed them upright on the floor. She brought a keg of the Hag’s home-brewed lager from the cellar and placed it behind the bar. As her regulars began shuffling from the docks to their accustomed places, she added two steins of Hag’s Blood to the soup, earning approving nods from several damp fishermen. “Shh!” she whispered, winking broadly, “If the Hag hears I waste good beer that way, it’s my job.” Everyone laughed. One young man, hardly more than a boy, tapped her twice on the shoulder, hesitating a little between taps. He held up a smallish fish, and said “Miss Mystery, I brung something for the soup.” His slender wrist trembled. Mystery kissed the boy gently on his smooth cheek and accepted his offering. “Free drink for you, then, Skip!” she said, and turned so she needn’t see him blush. She poured and delivered drinks to these early arrivals, cleaned Skip’s fish, cut it in pieces, and added it to the cauldron. 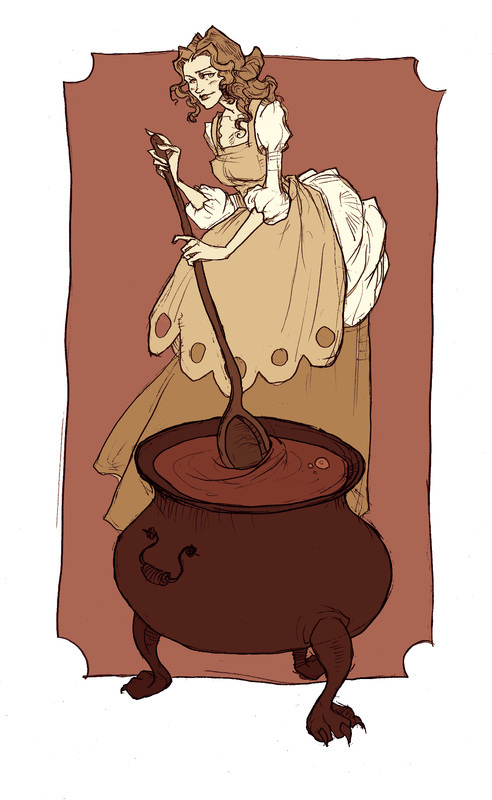 As she stirred the soup with a wooden paddle, she shook her head. This soup had been simmering nonstop as long as anyone could remember. When she had started serving at the Eye of the Storm, she had thought how disgusting it must be, but no one ever complained, and finally she had tasted it, prompted by a handsome and flirtatious stranger who had never returned, and she had been pleasantly surprised by its flavor. These days she thought of herself and the other barmaids at the Eye of the Storm tavern as the Sisters of Perpetual Soup. As the barstools and tables began to fill, Mystery served drinks, mostly Hag’s Blood lager. “Getting hungry, lass…” one old man whispered. She placed a hand on his bicep, and squeezed appreciatively. “Give it another half hour and we’ll fill you with soup, lover.” She moved to the next table before he could respond. His wife, a surprisingly young woman, pretended to glare at her back, but soon she was chuckling along with her husband. It was widely known that Mystery was all flirtation – she had not taken any man home from work as long as she had worked at the Eye. Soon the tavern was full, smelling of perpetual soup and fishermen, buzzing with conversation and getting loud. This was the part of her job that Mystery loved best. The customers focused on each other, leaving her to serve soup and beer and to eavesdrop. She reckoned barmaids were probably among the best-informed people in town, second to the streetwalkers. Well, maybe the Father Confessor over at the convent, but come to think of it she doubted even he got as much honest dirt as she did. “Soup’s real good tonight Myst!” one man shouted, to general agreement. “Thank Skip – brought us a great big flounder tonight he did,” she replied over one shoulder. Might as well let the boy get credit, she figured, even if it was mostly her meat had done the trick. She was more interested in what the folks were saying. There was a pale, scarlet-haired stranger in the corner, his back to the wall, watching the room and mumbling quietly into the ear of a middle-aged nun who had no business being here. He had rejected both soup and Hag’s Blood, but Mystery had talked the unlikely couple into a bottle of gin. She returned with a delicate bottle and two of the tavern’s six crystal tumblers, hoping to hear more about the murder – always good to hear an outsider’s impressions of local events, of course, but it was the nun Mystery really wanted to hear. Sadly, the handsome young man and his tidily wimpled companion clammed right up until she had taken their coins and gone back to the bar. “What do you mean? On the floor?” she said, hoping to draw out more details. But it was too much for Skip – he fled the bar and she imagined she could hear him retching on the street outside. The butcher’s date, overhearing, shuddered loudly and shook her head. “Disgusting. I didn’t like him peeking in at me when I was little. I felt bad being relieved when he stopped cuz he don’t like looking at adults. Won’t even say I’m sad he’s dead. But what kind of FREAK would braid . . .” The butcher quieted her with a hand on her shoulder. Inwardly, Mystery shook her head. What was Silence coming to? People simply did not appreciate effort properly. Rewards should follow effort. Mystery was proud of her work. It was not easy to weave entrails, and why had no one found his eyes? They were on the floor at his feet, just like in the statue at the convent.